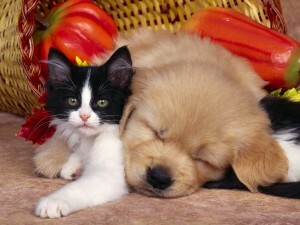 You are currently browsing the The Pet Product Guru blog archives for the day Wednesday, April 20th, 2011. Diabetes is on the rise, not only in humans. Diabetes diagnosis are rising at even a faster rates for dogs and cats. Dogs in the state of New Jersey have the sixth highest rate of diabetes in the nation and cats have the 10th highest rate. This is according to the 2011 “State of Pet Health” report. Diabetes affects about three in 1,000 dogs and 10 in 1,000 cats in New Jersey. The problems are caused by almost the same thing that causes diabetes in Humans. Obesity is one of the main causes. This occurs because pet owners are feeding the wrong kinds of food or larger portions. Here are some ways to help prevent diabetes in dogs and cats. Visit your vet. He will be able to tell if your pet is overweight. Practice portion control – read the label and feed the correct amount. Watch out for snacks and treats. They contain lots of calories. That’s how my older cat became a bit overweight. If it’s a new diet, ease into it slowly. Pick up the pace. All pets need exercise. Long brisk walks for your dog and a cat toy that your cat can chase around should do the trick. Skip the self feeder. Remove food after your dog is finished eating. Make sure that the water bowl is always full. Feed their souls with lots of love.